The triangular cupola is one of the Johnson solids. It is bounded by 4 equilateral triangles, 3 squares, and a regular hexagon. 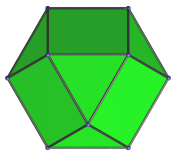 It is the third polyhedron in Norman Johnson's list, and thus bears the label J3. The triangular cupola can also be lengthened by attaching a hexagonal prism, forming the elongated triangular cupola (J18). Adding a second cupola in ortho orientation produces the elongated triangular orthobicupola (J35); adding a second cupola in gyro orientation produces the elongated triangular gyrobicupola (J36). It can also be lengthened by attaching a hexagonal antiprism, producing the gyroelongated triangular cupola (J22). Adding a second cupola produces the gyroelongated triangular bicupola (J44), a chiral polyhedron. 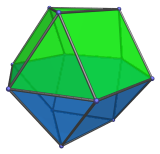 The triangular cupola can augment the truncated tetrahedron to produce the augmented truncated tetrahedron (J65). Parallel projection centered on top triangular face. Projection parallel to a pair of opposite edges of the hexagon. Projection parallel to a pair of opposite vertices of the hexagon. These coordinates describe a triangular cupola with edge length 2, resting on the XY plane with its axis of symmetry aligned to the Z axis. The triangular cupola described by these coordinates, however, is not in a “nice” orientation, as its hexagonal face is not perpendicular to the coordinate axes.